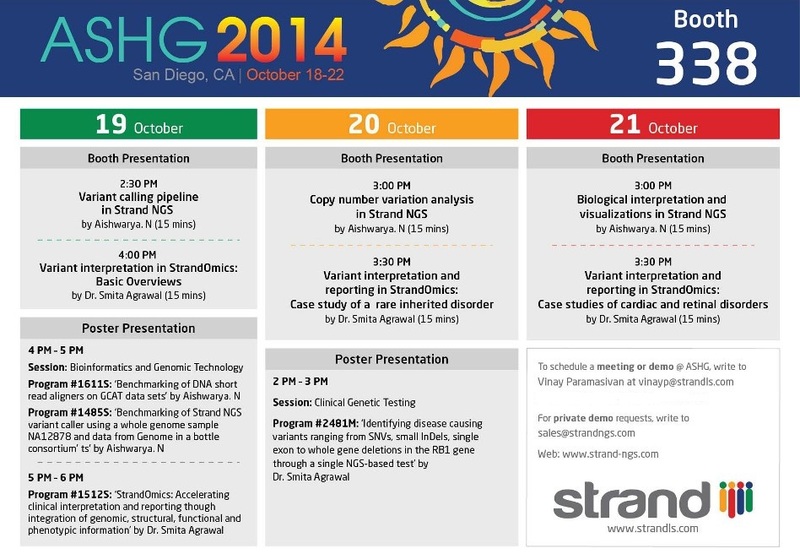 Strand is excited to be an exhibitor at the 64th Annual Meeting of the American Society of Human Genetics, San Diego from 18 – 22 October 2014, one of the world’s largest human genetics meetings. At ASHG, Strand will demonstrate the latest version of its state-of-the-art NGS data analysis tool ‘Strand NGS’ and interpretation and reporting platform ‘StrandOmics‘. At ASHG 2013, Strand had demoed Avadis NGSv1.5 and presented posters on ‘Aneuploidy and Normal Cell Contamination Aware Approach to Detect Copy Number Variations in Cancer Using Next Generation Sequencing Data’ and ‘Shortening the Diagnostic Odyssey: Integrating Genomic, Structural, and Phenotypic Information to Reduce Time of Rare Disease Diagnosis’. This year we are thrilled to present Avadis NGS with its new brand name ‘Strand NGS’ and ‘StrandOmics‘ tool for the first time at ASHG. Loads of new features and utilities with respect to visualizations and interpretations will be highlighted by our representatives at the booth # 338 at ASHG 2014. Come and meet our experts at ASHG 2014, booth #338, to learn more about Strand’s solutions.